As New York City grew in the late 1800's people looked for a way to escape city life and relax. Nearby Coney Island, a barrier island at that time, in the southwest corner of Brooklyn fit the bill with a bathing beach and a growing number of attractions. As the number of passenger steamers in the area grew the US Lighthouse Establishment responded to the increased need for navigational aids. In March 1889 Congress appropriated $25,000 to build a light station and fog signal at Norton's Point, but the government ran into a little trouble. Even back then people tried to sell the land for exorbitant prices and the owners asked for twice the lands value. The government started condemnation proceedings and bought the land for $3,500. 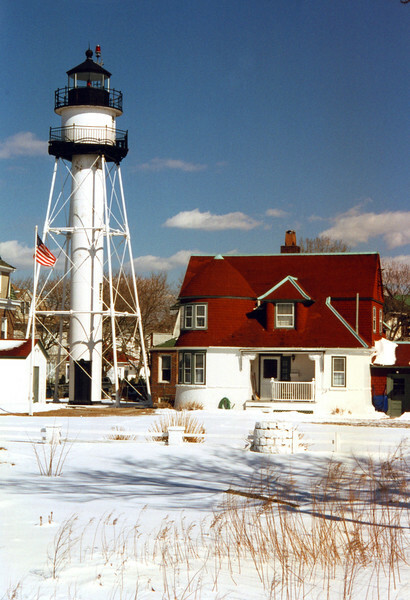 The original lights established at Norton's Point were a set of range lights. Erected in 1890 the front tower was an 18 foot wooden structure. The rear tower was a 68 foot skeletal tower. The Lighthouse Establishment decided in 1896 to discontinue the front tower and sold the property at an auction.